Advantages of Deburring Tool: Both sides in one pass, it helps user to easily deburr the front and back of the holes, and the cutting amount of chamfering can be controlled by adjusting speed and feed rate of deburring tool. 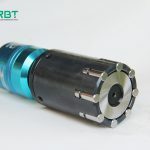 Working principle of Deburring Tool: During the front-end guide pin of the deburring tool enters the hole, The 45 degree angle of cutting edge depends on its elastic strength to chamfer and deburr hole, then passing through the hole, and continue to chamfer and deburr back-end hole. The outer diameter of the deburring tool is changed by elastic shrinkage during the font-end of deburring tool passes through the hole, the crowned and polished top surface of the blade will not mar the inside surface of the hole, when after passing through the hole, natural opening to achieve chamfer and deburr cutting. When the blade into the back-end of hole wall, whatever it is opened or closed, In both cases, there will be chamfered and deburred cutting accordingly, especially when the blade goes back, blade is closed, the 33 degrees of internal end angle increases to approximate 45 degree, then it can achieve chamfering approximately 45 degrees. 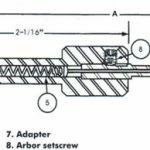 | Tags: chamfer hole with tool, chamfering and deburring tool, Deburring Tool, Deburring Tool Advantages, Deburring Tool Construction, deburring tool for metal hole, Deburring Tool Manufacturer, Deburring Tool Supplier, Deburring Tool Working principle, Forward-backward Deburring and Chamfering Tool, How deburring tools work? ← What are the features and benefits of the skiving and roller burnishing tools for the oil cylinder?